Of all the tons of manga released in the United States over the last ten years, encompassing various out-there titles, very few would go classified as the adult woman world of Josei. This manga’s demographic, constitutes an audience of older teen girls and women up to their early forties. 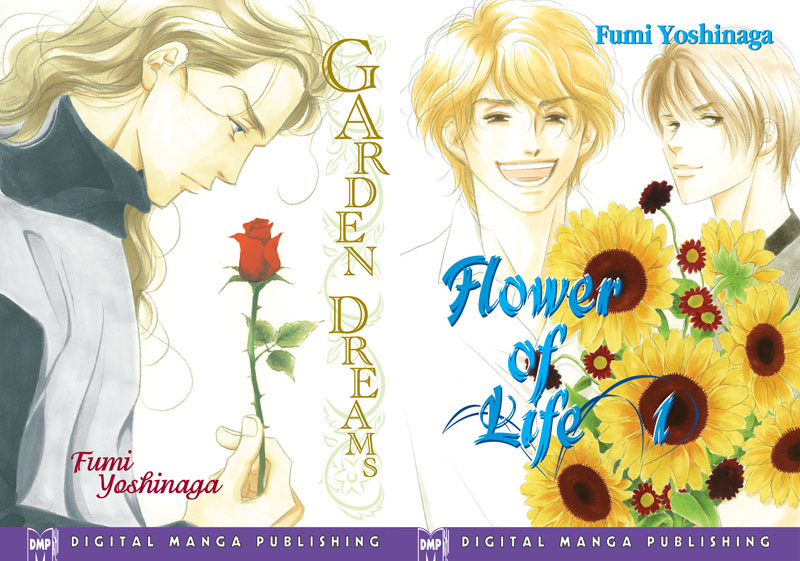 There have been some shining examples of Josei cherry picked for the American market like Yen Press’ With The Light by the late Keiko Tobe and Viz’s Ristorante Paradiso by Natsume Ono, both titles led by a female who is a good step into her adult life. The market even witnessed an attempted Josei publisher by the name of Aurora Publishing that released to (sadly almost) completion Chihiro Tamaki’s Walkin’ Butterfly, but they closed up shop a few years back. 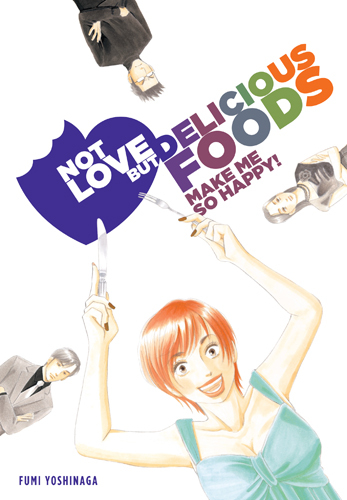 I personally believe that the last decade’s teenage female manga readers might have given Josei its fair run once given the chance, yet all I can do now is ponder as I take a look at 2005’s Not Love But Delicious Foods Make Me So Happy! and see what stories those readers might be missing. Not Love But Delicious Foods is a short single volume of work by Yoshinaga Fumi. Yoshinga Fumi currently has a wide breadth of works released by multiple publishers yet she is usually traced back to her most popular work Antique Bakery, entailing the lives of four adult men running a cake shop. Works like Flower of Life and Garden Dreams fit into the pseudo-Josei that is actually Shojo (an audience consisting of girls in their late teens) category, sharing the same place as Antique Bakery by being serialized in the manga anthology Wings. I bring this up because the line distinguishing between Shojo and Josei is finer than the embolden equivalent for Shonen and Seinen titles; I want to try to cover manga that conveys an age but it is not easy to compare an English counterpart. 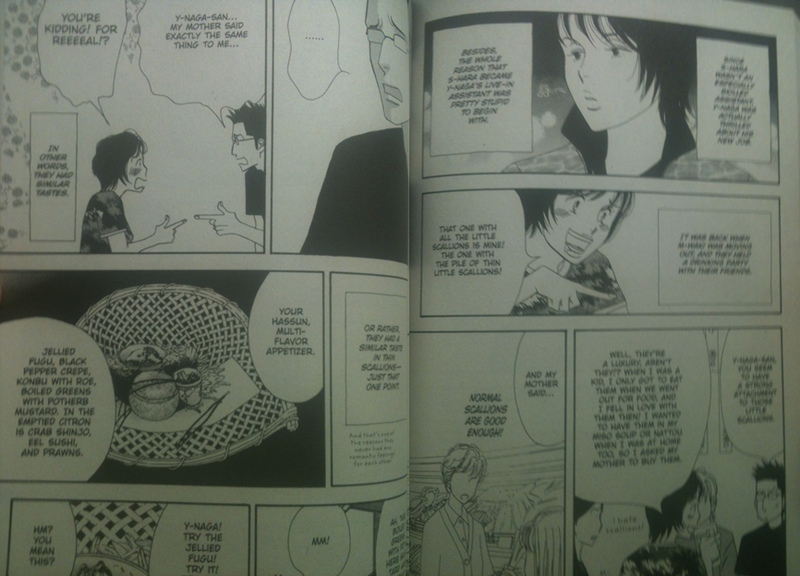 For lack of a better term, Not Love But Delicious Foods is a semi-auto-biographical/day-in-the-life story of Yoshinga Fumi (she addresses the lead as F-mi Y-naga but we as readers can figure this out). As F-mi narrates to herself (and portrays herself as homely as humanly possible) about her hectic work schedule where her days are spent both writing and drawing manga, eating, and sleeping, we learn that F-mi’s life revolves around the “eating” part the most. F-mi is a foodie, as in someone who loves to consume and at the same time discuss various high class meals like an attempted professional. Tasked with an assignment concerning introducing restaurants to readers, she is joined by her assistant S-hara at countless high priced eateries. Throw in some friends and coworkers from time to time and a light commentary on growing into one’s thirties, thus you pretty much have Not Love But Delicious Foods down pat. Exciting right? F-mi Y-naga goes out for Korean barbecue, Italian, French, and the occasional traditional Japanese foods. She fits eating methods like ordering from À La Charte, mixing food into a built-in countertop cooking pot, having someone bring you filled breads and sandwiches during work, and finally simply just eating parfait into Not Love But Delicious Foods. Problem is that F-mi is a picture perfect example of a foodie who simply loves to eat, to the point that she raves about everything in the same level of ecstatic glee and exuberance. This always positive attitude tends to speak for her dinner guests as well, for they too seem to love everything that occupies their tongues. This might just be because even though I inhale my food, I still feel that certain foods tasted better than others both texture and flavor-wise. This is not the case here with F-mi and company, who will gush about anything that involves eating while sitting down. I usually love Yoshinaga Fumi’s artwork, especially her distinctive character designs. Working on things stated earlier, F-mi is portrayed one moment as a (for a better word) frumpy and a visual mess, but when she goes out for research, she is drawn in an almost self-aggrandizing allure of kept hair and full lips. It is nice though to see her try to not lie to the reader that her heavy work load does not place a role in her appearance. Keeping this topic fixated on character designs (as many art related aspects I cover do tend to fall upon) Yoshinga Fumi does fill her works with some of the most glorious woman and men I have ever seen. Only problem for Not Love But Delicious Foods is that she hides these great designs in a plethora of unnecessary dialog boxes reminding you that F-mi’s extremely positive take on food has once again muddled the stories’ plot. Pros: Yoshinga Fumi’s realistic depiction of a mangaka’s busy life was nice to see without a glossy film slathered lie showcasing it as an easy going carefree rock star life. While I did prefer her food sketches in Antique Bakery, I still think that she can deliver some choice looking entrees. She can still draw the coolest looking men this side of a suit and tie. The cover itself stands out as being a relatively nice example of what her use of colors can accomplish. Cons: If you take Not Love But Delicious Foods as the stand alone work that it is and how Yoshinga Fumi uses it to professionally ramble off dialog box after dialog box, then it comes off the same way that I write reviews. Without an outside presence to shorten my writing, then like in this very manga, you have unnecessary amounts of lines to read bogging down the flow. The overly positive outlook on food pinpoints my nerves to an unsettling degree; it does not help a reader if you liked literally everything you could get your utensils on. This self-contained release harbors the winged “Y” of publisher Yen Press on its spine. I will interject another tidbit about the content of Not Love But Delicious Foods; at the end of every chapter is a detailed restaurant bio with things like time of operation and location. Even this conceivably cool way to convey restaurant information did not save it. And that is saying something because I personally love stuff like business heavy information like those demonstrated. 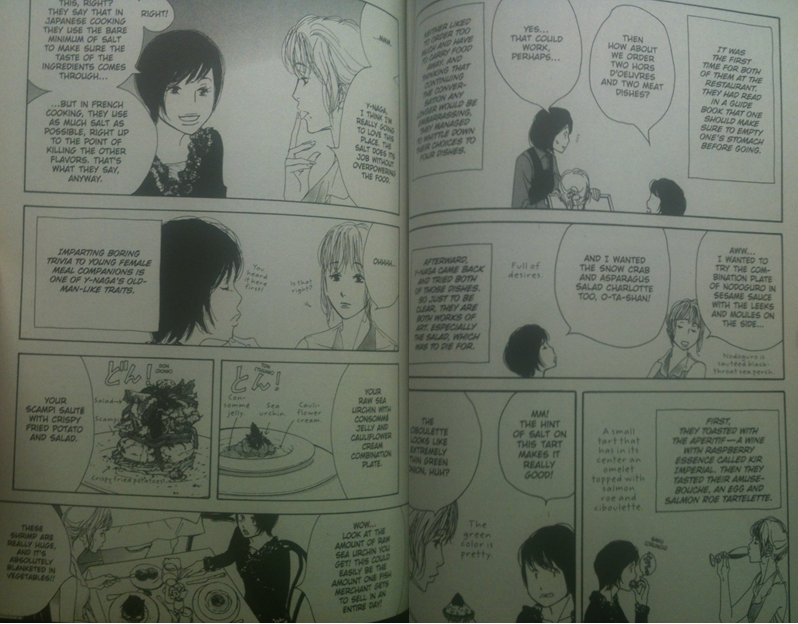 Not Love But Delicious Foods is a step in the right direction for what Josei could be for readers, but is caught up in its own world to realize that it is imposing itself too much on its guests; which as some of the stories in here can attest to, imposing oneself is the moral I garnered. Do not let Yoshinga Fumi’s smiling self-insertion character on the cover fool you, its pages are filled with frustration and unpleasantry . ‹ Megazone 23 Special – Part 1: So You Just Combined Streets of Fire With Science Fiction?